I was recently visiting family for my nephew's graduation ceremony. While the event was within driving distance, I decided to book a flight to the event to save some time. Besides, I had been traveling state-to-state for the last few weeks, and wanted to avoid having to get up early and make another 10-hour drive. The flight would put me there about four hours before the event, plenty of time to arrive, relax, change clothes and get there. Also, I had a show the night before and was exhausted, so a short flight seemed to be the best overall way to travel. The only problem was that the flight became delayed so many times that I missed all connecting flights that would have put me where I was going on time. I missed the graduation ceremony altogether. I could actually have driven and arrived on time. At least I arrived on time for the party that evening, celebrating my youngest nephews exit from the high school realm. While we were there visiting and I was expressing my frustration at my travels (which is another story altogether), my son-in-law told of a time he was stuck in a traffic jam (I forget where exactly, I believe it was near Wash. D.C., but don't quote me on that). He had been hunting and had some...well, let's just say "freshly-taken venison" in the back of his truck. It was hot and he was sitting in traffic for quite a while. Then he noticed some smoke up ahead. That's right, he stripped deer and they cooked it right up, right there alongside the highway. The smell of the cooking meat was so wonderful that people got out of their cars and came over to where they were cooking. They shared their fresh, yet primitive culinary creations with people sitting in the traffic jam. It was an odd win-win; people were hungry after sitting so long, and they didn't want the meat to spoil in the heat. Friends were made, spirits were lifted, jokes and laughs were told, etc., all by people who were commiserating along the highway and enjoying some steaks. Whether it was legal, safe, or what-have-you, I really don't care. There were a lot of strangers who came together that day and made the best of an otherwise miserable situation for all involved. 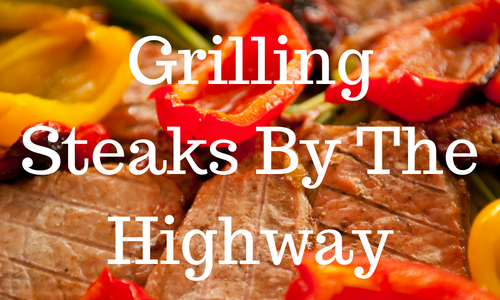 I believe the life lesson/analogy is fairly clear--when life throws you traffic jams, grill steaks.